The Theme allows creating as many new page layouts as you wish. 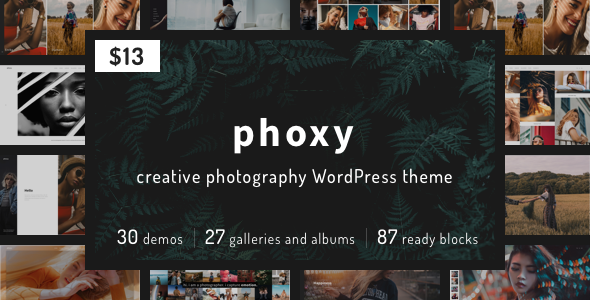 PHOXY comes with 30 Home pages, 13 Albums templates, 5 Blog types, 14 Galleries, Clients and Booking page to choose from. There are Service, About me/us and Contact layouts to select from, and with our one click demo importer you will be up and running in no time – with no coding required! PHOXY is fully responsive and designed with high end photography in mind so naturally it is an ideal theme for mobile friendly websites and applications, every single feature and page element will look amazing on the screens of tablets and mobile phones. It includes amazing page templates and professionally designed layouts created specifically to be the most responsive visual environment on the market today. We made the theme compatible with such premium plugins as WHizzy, Appointment booking plugin, Contact form 7, Google Maps, WP Bakery Page-Builder drag and drop page builder tool and The Grid. Allow quests to book appointments without the need for registration. It is easy for your customers, as only name and email address will be required to book appointment. PHOXY theme is fully responsive. No matter what device your visitors are using to access your site, the layout will fluidly respond to the screen size to ensure they can still read, browse, shop, download, and interact with your website in every other way. All images in Phoxy Theme can be used only on demo version. You will need to upload your own images for your site.